BOSTON — Researchers at the Wyss Institute for Biologically Inspired Engineering at Harvard University have mimicked pulmonary edema in a microchip lined by living human cells, as reported today in the journal Science Translational Medicine. They used this "lung-on-a-chip" to study drug toxicity and identify potential new therapies to prevent this life-threatening condition. The study offers further proof-of-concept that human "organs-on-chips" hold tremendous potential to replace traditional approaches to drug discovery and development. "Major pharmaceutical companies spend a lot of time and a huge amount of money on cell cultures and animal testing to develop new drugs," says Donald Ingber, M.D., Ph.D., founding director of the Wyss Institute and senior author of the study, "but these methods often fail to predict the effects of these agents when they reach humans." It turns out the physical act of breathing greatly enhances the effects of IL-2 in pulmonary edema — "something that clinicians and scientists never suspected before," Ingber says. 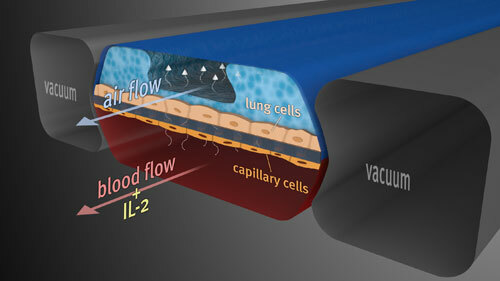 When the team turned on the vacuum attached to the chip to simulate breathing, it increased fluid leakage more than three-fold when treated with the clinically relevant IL-2 dose, and the Wyss team confirmed that the same response occurs in an animal model of pulmonary edema. This result could suggest that doctors treating patients on a respirator with IL-2 should reduce the tidal volume of air being pushed into the lungs, for example, in order to minimize the negative side effects of this drug. Combining microfabrication techniques with modern tissue engineering, lung-on-a-chip offers an in vitro approach to drug screening by mimicking the complicated mechanical and biochemical behaviors of a human lung. Most exciting for the future of drug testing was the Wyss team’s finding that "this on-chip model of human pulmonary edema can be used to identify new potential therapeutic agents in vitro," Ingber says. The pulmonary edema symptoms in the lung-on-a-chip disease model could be prevented by treating the tissues with a new class of drug, a transient receptor potential vanilloid 4 (TRPV4) channel blocker, under development by GlaxoSmithKline (GSK). In a separate study published by the GSK team in the same issue of Science Translation Medicine, the beneficial effects of TRPV4 inhibition in reducing pulmonary edema were independently validated using animal models of pulmonary edema caused by heart failure. "In just a little more than two years, we’ve gone from unveiling the initial design of the lung-on-a-chip to demonstrating its potential to model a complex human disease, which we believe provides a glimpse of what drug discovery and development might look like in the future," Ingber says. The cross-disciplinary, multi-institutional team that was led by Ingber and Huh also included Wyss Postdoctoral Fellow Daniel Leslie, Ph.D.; Benjamin Matthews, M.D., assistant professor of pediatrics in the Vascular Biology Program at Boston Children’s Hospital and Harvard Medical School; Wyss Institute Researcher Jacob Fraser; Samuel Jurek, a researcher at Boston Children’s Hospital and Harvard Medical School; Senior Wyss Staff Scientist Geraldine Hamilton, Ph.D.; and Senior Scientific Investigator Kevin Thorneloe, Ph.D., and Investigator M. Allen McAlexander from GlaxoSmithKline. Ingber is also the Judah Folkman Professor of Vascular Biology at Harvard Medical School and Boston Children’s Hospital, and Professor of Bioengineering at Harvard School of Engineering and Applied Sciences. 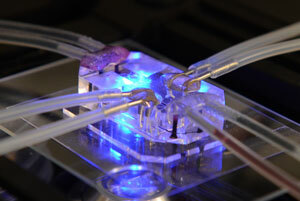 "Organs-on-a-chip represents a new approach to model the structure, biology, and function of human organs, as evidenced by the complex breathing action of this engineered lung. This breathing action was key to providing new insight into the etiology of pulmonary edema," said Dr. James M. Anderson, M.D., Ph.D., director of the NIH Division of Program Coordination, Planning, and Strategic Initiatives that provided partial support for this research through the Common Fund’s Regulatory Science program. "These results provide support for the broader use of such microsystems in studying disease pathology and hopefully for identifying new therapeutic targets." The work was funded by the National Institutes of Health (NIH) and the Food and Drug Administration (FDA), Defense Advanced Research Projects Agency (DARPA), and the Wyss Institute for Biologically Inspired Engineering at Harvard University. The Wyss Institute for Biologically Inspired Engineering at Harvard University (http://wyss.harvard.edu) uses Nature’s design principles to develop bioinspired materials and devices that will transform medicine and create a more sustainable world. Working as an alliance among Harvard’s Schools of Medicine, Engineering, and Arts & Sciences, and in partnership with Beth Israel Deaconess Medical Center, Brigham and Women’s Hospital, Boston Children’s Hospital, Dana Farber Cancer Institute, Massachusetts General Hospital, the University of Massachusetts Medical School, Spaulding Rehabilitation Hospital, Boston University and Tufts University, the Institute crosses disciplinary and institutional barriers to engage in high-risk research that leads to transformative technological breakthroughs. By emulating Nature’s principles for self-organizing and self-regulating, Wyss researchers are developing innovative new engineering solutions for healthcare, energy, architecture, robotics, and manufacturing. These technologies are translated into commercial products and therapies through collaborations with clinical investigators, corporate alliances, and new start-ups. The Wyss Institute was recently awarded the prestigious World Technology Network award for innovation in biotechnology.